Egg whites are popular among the athletic crowd, because they are a convenient and economical way to add protein to your diet. As a very low-calorie, readily absorbed source of protein, egg whites also fit well into a weight-loss diet. Protein is particularly crucial during weight loss, because it provides the building blocks to repair and rebuild muscle tissue, which can be lost during calorie restriction. Replace whole eggs with egg whites -- at a ratio of one whole egg to two egg whites -- in recipes to decrease the calorie, fat and cholesterol content of the dish. One whole large egg contains 70 calories, 5 grams of fat and 70 percent of the recommended daily cholesterol. Two egg whites contain 32 calories and virtually no fat or cholesterol, with a similar amount of protein as a whole egg. Omelettes, quiches and frittatas are the most obvious dishes that can be slimmed down, but you can also use egg whites to coat chicken or fish before breading and substitute egg whites for eggs when baking. Replace higher-calorie meats with egg whites as the protein portion of your meal. Instead of bacon or sausage at breakfast, eat egg whites scrambled with fresh herbs, vegetables and up to 1 ounce of low-fat cheese. Scrambled egg whites make a great alternative to high-calorie and/or high-sodium deli meats in sandwiches. Although you should not consume raw egg whites due to the risk of salmonella poisoning, you can add a pasteurized egg-white product to a smoothie to increase protein content and make a quick on-the-go meal. One-fourth cup of pasteurized egg-white product is approximately equivalent to one egg white. Consume an egg white-containing meal within 60 to 90 minutes after strength-training activity. Eating a meal containing protein and carbohydrates may increase muscle protein synthesis. Since muscle tissue has a high metabolic rate, increasing muscle mass will lead to increased calories burned even at rest, perhaps enhancing weight loss. 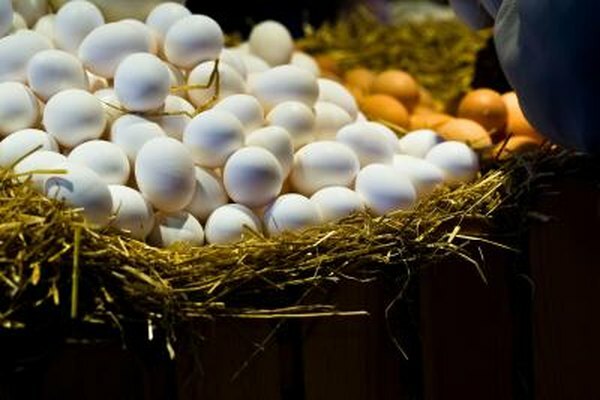 Egg whites should be incorporated into a balanced, reduced-calorie diet to maximize weight-loss potential. Regular exercise incorporating resistance training will maximize the muscle-building potential of egg whites, which helps increase fat loss. Egg whites should be cooked thoroughly to reduce possible Salmonella poisoning. Pasteurized egg whites are a safer alternative if you plan on using raw or lightly cooked eggs in a recipe. You should practice moderation when incorporating egg whites -- or any food -- into your diet to ensure you take in a proper balance of carbohydrates, protein, fat and the appropriate number of calories for your weight, age and activity level. It is wise to discuss weight loss plans with your doctor or nutritionist. American Dietetic Association: Question of the Day: I Am Trying to Lose Weight. What Should I Order When I Go out to Breakfast or Brunch?